Bargain Hound – Hunting down ways to help you save! I’ve been eating seafood for as long as I can remember. I don’t only eat seafood, I love it. And I love it all. Calamari, Haddock, Cod, Mahi, Tuna, Clams, Shrimp, Lobster, Crabs, even Anchovies. I used to say “I never met a fish I didn’t love”. My mom and I went shopping to somewhere we don’t go very often, and one of the perks of shopping in this specific area is our favorite seafood restaurant. We were craving one of their fish fry’s. They are, hands down, the best fish fry ever. And we always get their hand battered onion rings to go with our fish fry. Before we knew it, our order was up and we couldn’t wait to dig in to our lunches. My mom and I were talking while eating, and I tend to eat much slower than the average person. I always have. I look at everything I eat. And this is why. As I’m eating my fish, I noticed something strange in the center of it. My mom looks at me and asks what it was. I used my fork to place it on a napkin. It was a WORM. IN MY FISH. At first I think we were a little in denial. I mean, it can’t be a worm in my fish fry, right? It must be something else that looks like a worm. I then started digging around in my fish, and there was another one. Curled up. My mom and I were completely startled at that point, and since she eats a little faster than me, she had less fish left on her plate, but still had some left. She starts looking through her piece of fish, and yep – you guessed it – another worm in HER fish. We immediately stopped eating (and tried our best to keep from vomiting) and my mom grabs the pieces of fish and puts them on a napkin and goes to the counter. This is where it gets even more alarming. The manager tells my mom that they are aware of the worms in our fish. In fact, he didn’t call them worms. He called them PARASITES. He said they are in all fish, and that someone just didn’t clean out the fish very well. She did end up getting a full refund on our meal, and needless to say, we quickly left, feeling sick to our stomachs. Mind you, I am 43 years old and my mom is in her 60’s. We have been eating fish all our lives, and have never seen worms in our fish. I did come straight home and started researching, and found out that yes, this is normal. There are different types of worm parasites, some are worse than others, and some can be very dangerous. I have no idea what kind of parasites these were, but I will tell you this – I am never, EVER, eating seafood of any kind, ever again. I have a freezer full of shrimp, shrimp scampi, Mahi, calamari and other seafood, and they are going directly into the garbage. I find this extremely alarming that this is “normal” and I have no desire to consume worm parasites, I don’t care how normal or “safe” they are. I urge you to do a YouTube search for “worms in fish”. But be forewarned, it is sickening and alarming. Still plan to enjoy your seafood? Bon Appetit. I, for one, will most definitely not be joining you. It has taken me 5 years to write this post. I wanted to write it a long time ago, but wanted to wait until I saw how the quality of the products held up. This is a post on why you should NEVER, EVER, under any circumstance – purchase furniture from Ashley Furniture stores. In November 2011, we were shopping for a new couch set. We shopped around quite a bit, and were specifically looking for a sectional sofa set. And we did not want microfiber (I hate how it shows every hand print or anywhere you touch it) and we wanted something that was easy to wipe off dog hair, since we have shedding Chihuahuas. When we walked into Ashley Furniture, we were quickly greeted by a saleswoman, who was anxious to show us what they had. We really liked the leather sofas. When we saw this set, we fell in love with it. It was a 3-piece sectional with 4 electric recliners. It was beautiful. We sat in it, and it was very comfy. But we were concerned because it was not 100% leather. We were told it was a “Durablend leather” which was a leather blend. The saleswoman actually told us this would last longer than actual leather, because real leather wears out and we would quickly see spots like where our heads leaned up against the couch. After still shopping around a bit, we decided this was the couch set we wanted. We also bought a new dining room table – an extra high dining room table with 8 chairs, and the matching hutch. Together, we spent around $7,000. The couch alone was around $4,000. We were told about their extra warranty that they pushed hard on us to purchase. It was an additional $499. She said if we were to puncture it, tear it, stain it, etc – the repair company would come right out to fix it. She named off a million things it covered, and we figured it was a good investment on our furniture purchase, so we went ahead and purchased it. This was a couple weeks before Thanksgiving, and we were given a delivery date of about a week before Thanksgiving. It was very important that we had all of our new furniture before Thanksgiving, as we were having family over, and would have had no where to eat or relax, since we had someone picking up our old dining room furniture & couch set shortly after purchasing our new furniture at Ashley. A couple days before our furniture was to be delivered, we received a call stating our furniture was on back order. I FLIPPED. They said our dining room table was in, but no chairs. And since we purchased a table that was higher than an average table, you could not use regular chairs. They said they could loan us chairs to use with the table. But as far as the couch – back ordered. I ended up making many phone calls and going back and forth with Ashley and they were some how able to get our couch from another location and get it to us in time for Thanksgiving. A few days before Thanksgiving, and they delivered our couch, and dining room table. They also gave us “loaner” chairs – but they were normal height chairs, and when you sit in them, you could not even reach the top of the table. Had to have the delivery guys bring them back, and I had to get back on the phone with Ashley again. Oh – and when our table was delivered, the delivery guy notified us that we can’t use soap & water on our new table. I was like, what??? He said yeah, it has a coating on it, so you can only use plain water. I have never heard of such a thing – and had they told us that in the store, we wouldn’t have purchased it!!! How can you wash a table without soap???? So before we used the table, we had to purchase a piece of vinyl to put over the table, and that’s what we eat on. This way we can clean the vinyl with soap & water. Anyways, after lots more phone calls with Ashley, they were some how able to get us the chairs we ordered for our dining room table, and we received the couch and dining room table & all chairs a few days before Thanksgiving. The hutch we purchased was being delivered like a couple days before Thanksgiving. It arrived on time, and the delivery men had to install the top part of the hutch to the bottom part, and then add the backing to the back of the top part of the hutch. Well, when they installed the backing to the hutch, they screwed in a couple screws in the wrong places, and the screws were showing right through the center of the hutch. And when we went to open the bottom drawer, the drawer was broken. They ended up coming back, picking it back up, fixing it, and returning the hutch back to us. What a HASSLE! But that’s not even the worst part. For about the first year, we loved our new couch. But that $4,000 purchase was quickly turning into a costly mistake. The couch was starting to PEEL. And it was only peeling where we sat. Behind our heads, where our arms & hands lay, and where our feet & legs lay. And mind you, it’s just my boyfriend and I, and the dogs do not sit directly on the couch – they lay on our laps, or on the beds we would place on the couch. The only time anyone sat on the other part of the couch was my parents, maybe once or twice a year. We are extremely gentle on our furniture. A couple years after we purchased it, the peeling was out of control. Whenever we get off the couch, we have to “shake” out our clothing so the little pieces of the couch will fall off of our clothing. I remembered we bought that $500 warranty and called them. They said our warranty did not cover peeling of the material!! I was livid. About a year later, and where Chris sits – a spring or something broke under his seat, and the cushion became nonexistant, and when he sat in his seat, it was like sitting on a board. I called the warranty company about fixing his seat – they said our warranty did not cover it. Then, about a year after that, I was sitting in my seat with the foot rest up, and I pressed the button to the side to put the foot rest down so I could get up – and it no longer worked. Chris tried everything to fix this – and nothing would fix it. I called the warranty company – and guess what they said? Sorry, electrical issues are not covered under this warranty. So here we are, 5 years later. And we just – embarrassingly – put the couch to the curb for the disposal company to pick up tomorrow. This is what our $4,000 couch looks like after 5 years of gentle use. The corner piece, which you can see in the below photo, where no one ever sat, is still like brand new, and even has the tags still attached to it. So we are now using the other part of the couch that we didn’t use, and that’s just until we can find a quality couch to purchase. But I can tell you one thing – we will never be scammed by Ashley Furniture again. We will never step foot in another Ashley Furniture store EVER AGAIN. And if you want to avoid the hassles, horrible customer service, and the waste of money, you will avoid them too. And don’t just take my word for it – click here to read another 1,859 complaints from other consumers with the same type of problems that we experienced. Have you had a negative experience with Ashley Furniture? Feel free to comment below! If you love coconut and chocolate, you are going to LOVE this super simple no-bake recipe. I made these for Christmas and everyone loved them. Typically when I need caramels, I buy Kraft caramels. But to my surprise, I could not find them anywhere! My only options were Werther’s soft or chewy caramels. I did choose the soft caramels for this batch, but in the future I will buy the chewy instead. These were just a little too soft in my opinion. So grab a pan, and add your milk, butter and caramels and turn on medium heat. Keep stirring until it’s all melted together. If you have the heat on too high, it will burn, so keep a close eye on it. Next, grab a baking sheet that’s lined with parchment paper, and drop spoonfulls of the coconut mixture on the cookie sheet. Let it cool completely. Once the coconut drops have cooled, melt your chocolate. You can use a double broiler, but I prefer the microwave in 30-second bursts, stir, and another 30-seconds until it’s all melted. Once your chocolate is melted, dip JUST the bottoms of the coconut balls into the chocolate, and place back on your cookie sheets. Now get a plastic baggie (or a piping bag if you prefer) and pour the melted chocolate in it. If using a baggie, just snip off a tiny (VERY tiny) corner of the bag, and use it to drizzle chocolate over your coconut balls. Sprinkle a little sea salt to the tops if you like. Let it all cool completely again so the chocolate hardens, and voila! You are done. You can refrigerate them, or leave them at room temperature. When I was younger, I was all about chocolate chip cookies, brownies, anything chocolate. Sugar cookies never appealed to me. They always tasted bland to me. Well one day, one of our neighbors who often came over to have coffee with my mom, brought over a batch of her home made frosted sugar cookies. If I remember correctly, they were in the shape of pumpkins, and so cutely decorated. You know how they say you eat with your eyes first? They looked delicious, so I tried one. And to my surprise, I loved them. They were not like any other sugar cookie I had tried. She was kind enough to share her recipe with me, and these are now cookies that are regularly requested from family & friends. They are perfect as cut-outs, so they make great cookies for absolutely any holiday or any occasion! First, sift your dry ingredients together in a bowl (sugar, flour, baking powder, baking soda, salt). Then add in your wet ingredients (butter, eggs, vanilla). Mix well. Grab a handful of the dough, and spread out on a floured surface. I use a rolling pin to make the cookies nice & thin. You can use any type of cookie cutter you’d like. I was baking a ton of cookies this day and didn’t have the time or patience to do lots of cute cut-outs, so I used my round biscuit cutter. Just be sure your surface is floured well, and sprinkle some flour to the top of your dough before rolling it out, so it won’t stick to your rolling pin. After you cut out all of your cookies, spread them out on a cookie sheet. I always line my cookie sheets with parchment paper. Bake them at 350º for around 10-12 minutes. When you take them out, they will look like this. The thinner you roll them out with your rolling pin, the crispier your cookies will be. I personally prefer them crispy, but some of my family members prefer them softer, so I don’t roll them out quite so thin. You can use whatever frosting you like, but I do love Pillsbury Vanilla frosting on these cookies. Easy peasy! You can split up the frosting into different bowls and add food coloring if you’d like to color your frosting. I was lazy and left the frosting white, and just sprinkled them with candy sprinkles on top. Try them just once and you will see why these cookies are so popular! This is a very thick, dense coffee cake with a delicious cinnamon streusal on top. I’ve made this coffee cake countless times over the years, as it’s the cake my mom always requested for her birthday, instead of a traditional birthday cake. It’s been a few years since I made this cake, but surprised her with this cake at Christmas. Unfortunately for her, everyone loved this cake so she had to share! lol They called this a great “dunker” cake and had it with their coffee. Hence, “coffee cake”. Ha. Cream sugar, butter & egg. Add vanilla. Sift flour & powder together separately. Add dry ingredient mixture alternately with milk to batter mixture, beating well. Pour in well greased & floured square pan (10x10x2). Mix the streusal ingredients in separate bowl, and then spread on top of cake batter. Bake at 350º for about 45-50 minutes. ‘Tis the season to start thinking about New Year’s resolutions! We all know that diets are the #1 resolution. So this offer is back – kickstart your low car weight loss program and Sign Up for Atkins Free Quick Start Kit! 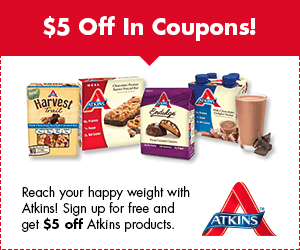 You will also receive $5 in coupons towards Atkins products!